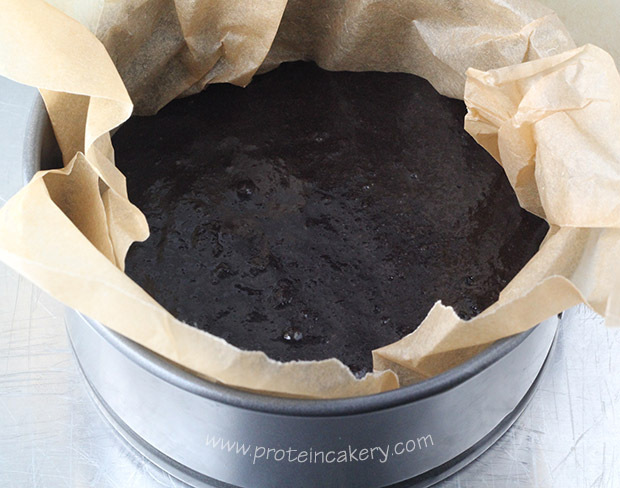 I wasn’t planning on making a Devil’s Food Protein Cake. I was working on a recipe for whoopie pies (a reader request), and the cookies came out great! 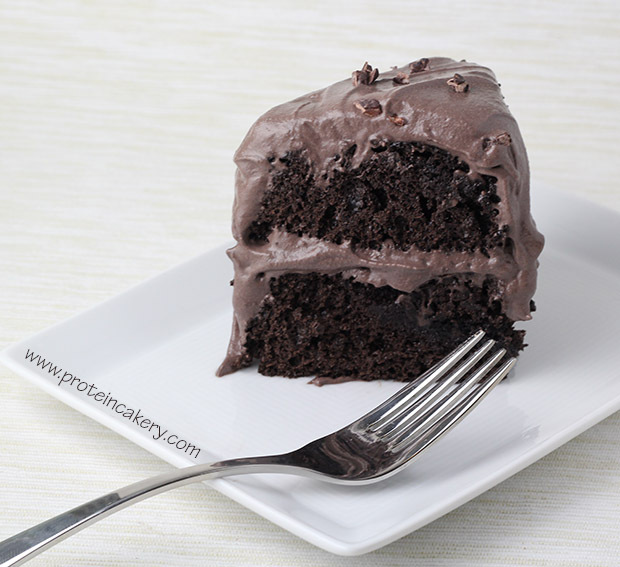 So I scaled up the recipe, made some frosting, and now we have a moist and delicious Devil’s Food Protein Cake! Also unplanned was the rugged shape of the cake, which I love. That happened because I was too lazy to cut my parchment paper to properly line the pan. I just put the whole sheet in, pressed it down, and poured in the batter. The cake is egg-free, gluten-free, grain-free, nut-free, and pretty simple to make! No fancy ingredients, here: whey protein, applesauce, cocoa powder, baking powder, and a touch of salt. 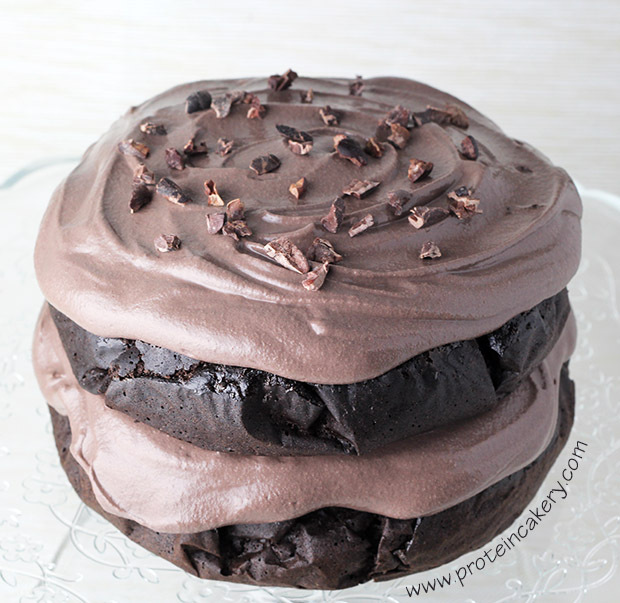 The frosting is made from soaked raw cashews (which make a great Cashew Whipped Cream) with some chocolate whey, cocoa, and stevia. I went for a lighter frosting because this cake is a bit more delicate than other recipes I’ve made, and I didn’t want the cake to break as I frosted it. That’s also the reason I baked it as two separate cakes, unlike my Confetti Protein Birthday Cake (and some others) that I bake as one cake and slice. Also, I used black cocoa here, but regular cocoa would also be delicious! Makes one 6" double-layer cake (6 servings). Drain and rinse cashews, and put in blender. Add ½ cup filtered water to blender, and blend cashews to a cream. If needed, add more water by the tablespoon (15ml). Add cocoa, stevia, and whey powder. Blend until smooth. Put frosting in the freezer to cool while you bake the cake. Line two 6" round (or similarly sized) pans with parchment paper (or use 1 pan, and bake them one at a time). Mix all cake ingredients until well combined. Bake for about 15 minutes, and see if the cakes are firm. Check every 1-2 minutes, and remove as soon as they are firm. Be sure not to over-bake these cakes! As the cakes are baking, stir the frosting and set back in the freezer. Spoon half the frosting on the bottom layer. Set the top layer in place, and spoon remaining frosting on top. Top with a few raw cacao nibs, if desired (not included in macros, but would hardly change them anyway). 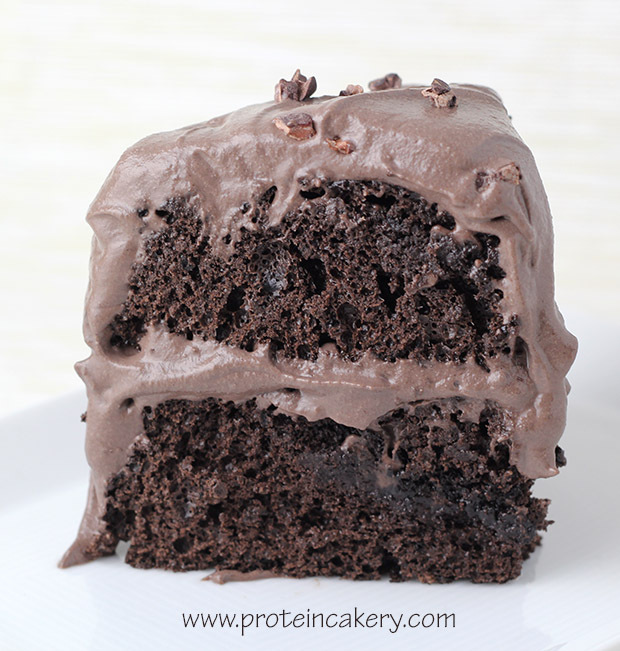 A note about substitutions: because each type of protein powder has a distinct flavor and texture when baked, I would not try substituting different types of protein powder in the recipe for the cake. (Vegan proteins would need egg whites and less applesauce for the proper cake-like texture, and probably still wouldn't match the moist, airy texture here!) For the frosting, a vegan protein like Vega Sport should work, but others may be too chalky. 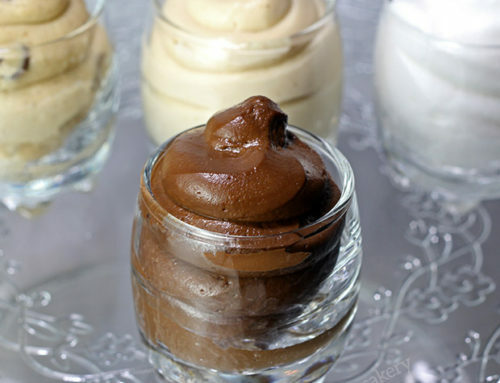 Casein can also be used in the frosting in place of the whey. 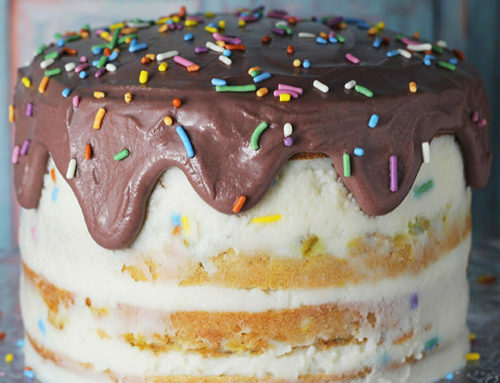 If you are making one single-layer cake, you can just use one 8" round pan, and the timing should be similar. Macros for ⅙ of the unfrosted cake are: Prot: 24 g, Carbs: 17 g (Fiber: 3g, Sugar: 10g), Fat: 2 g, Cal: 177. Also, when using parchment paper like I did, be sure to trim the top edges of the paper (after the batter is in the pan) so that the parchment doesn't touch the roof of your oven. Parchment is paper, after all, and it will burn if it touches oven surfaces.